Our management company, Goodwin, has agreed to come out for a third opportunity to issue Pool Key Cards right here in our neighborhood. 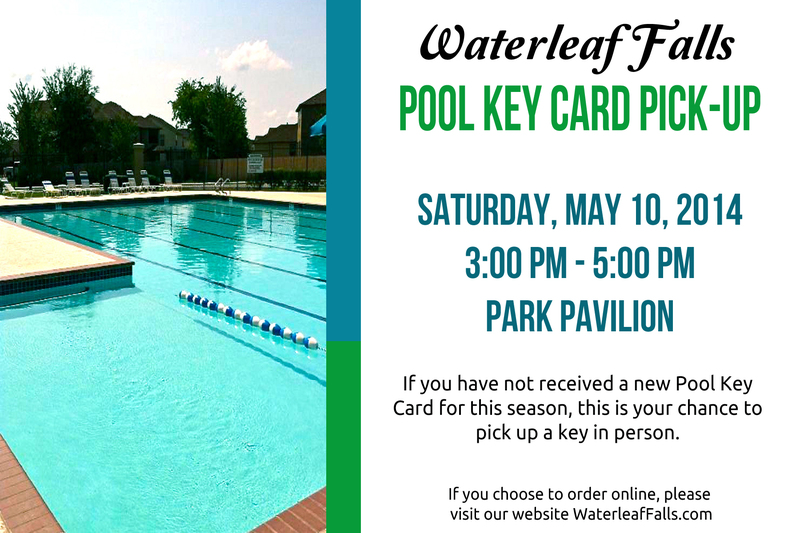 Please come out to the Park Pavilion Saturday, May 10 between 3pm and 5pm to pick up your Pool Key Access Card. The cards will be active that day, but the management team will go back and verify the paperwork and that the homeowner is in good standing (annual assessments paid or payment plan in place). If you are not in good standing, the card will be deactivated immediately. For anyone who has already submitted the online application, we have verified that your key should arrive to you via mail by Friday. They are now processing within 1-2 days, so you can still go to poolkey.com today or tomorrow to receive your key by Friday. Otherwise, you may come out on Saturday to pick up a key in-person.